Before computers, there were abaci (plural of abacus). They were used as a calculation tool for hundreds of years. They were popular to the Greeks, Romans, Chinese, Japanese and Koreans. However, history tells us that there were way earlier versions of the modern abaci we know. According to Wikipedia, they existed in Sumeria as early as 2700 BC. In this post, we are going to learn to use an abacus, particularly the Japanese abacus. The Japanese word for abacus is soroban. It is very similar to other abaci which consist of a frame with beads sliding on wires or rods. A horizontal beam as shown in the figure above divides the bead into two groups. The beads at the upper part of the beam are called the Heaven Beads, while the beads below it are called Earth Beads. Just like writing numbers, rods represent place value. Each bead in the rightmost rod is worth 1, in the next rod worth 10, the third rod is worth 100, and so on. The Heaven Bead is worth 5 times the Earth Bead. So, in the hundreds place, the Heaven Bead is worth 500 as shown above and the Earth Beads are worth 100 each. Below are several numbers represented by the Japanese abacus. You can represent numbers using the beads by pushing them toward the beam such that the beads and the beam touch. 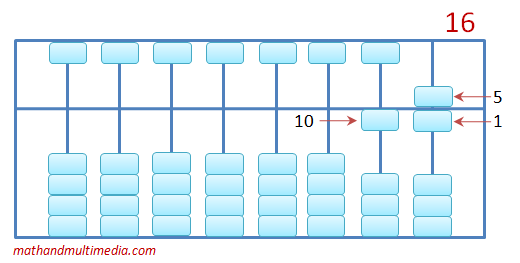 For example, to represent 16, one way is to push 5 and 1 toward beam in the ones place and push 10 towards the beam in the tens place. If we add the value of the beads near the beam, we have 10 + 5 + 1 = 16. The preceding examples (click image to enlarge) show representations of different numbers. 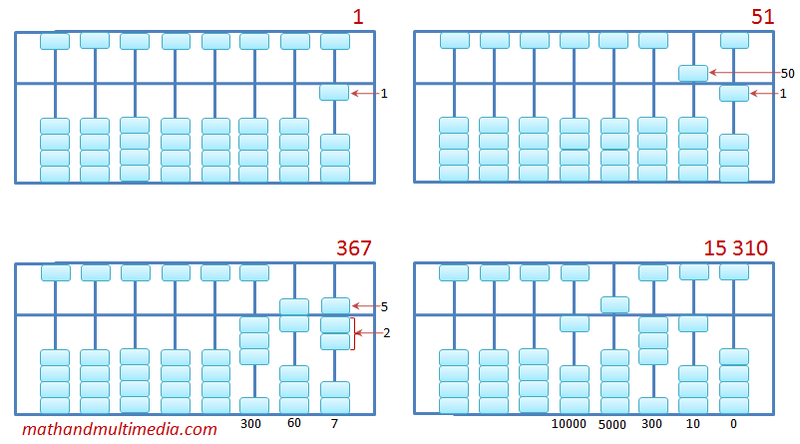 Study these representations and they should be enough for you to calculate using an abacus.